The Nationals have recalled right-hander Austen Williams from Triple-A Fresno. Williams tallied an ugly 15.43 ERA in just 2.1 innings of work at Triple-A Fresno, but looked sharp throughout Spring Training (0.00 ERA, 2 Saves in 7.2 innings of work) where he impressed Washington's major-league coaching staff. 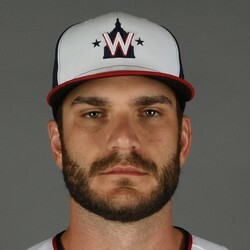 He'll replace Justin Miller (who has been placed on the 10-Day IL) in the Nationals bullpen.